Note the radiograph below for anatomical information. 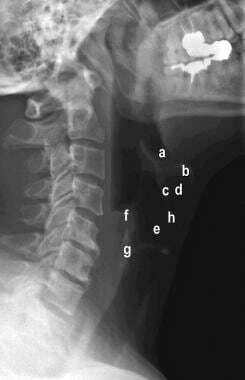 Lateral radiograph of the neck showing the different structures of the larynx: a, vallecula; b, hyoid bone; c, epiglottis; d, pre-epiglottic space; e, ventricle (air-space between false and true cords); f, arytenoid; g, cricoid; and h, thyroid cartilage. Supraglottis: The supraglottis extends from the epiglottis superiorly to the true vocal folds inferiorly. This subsite includes the epiglottis, aryepiglottic folds, arytenoids, and false vocal folds. Glottis: These are the true vocal folds. Subglottis: This extends from the true vocal folds superiorly to the first tracheal ring inferiorly. For all tumor subsites, Tx designates tumors that cannot be assessed, T0 is used when no primary tumor exists, and Tis means carcinoma in situ. Total laryngectomy is a surgical option for patients with advanced stage laryngeal cancer that includes 1) tumors with cartilage destruction and anterior spread outside the larynx, 2) posterior commissure or bilateral arytenoid joint involvement, 3) circumferential submucosal disease, and 4) subglottic extension with extensive invasion of the cricoid cartilage. Surgical salvage can be considered for patients who fail radiation therapy or partial laryngectomy procedures. Total laryngectomy can also be considered in patients with extralaryngeal tumors that have invaded the larynx such as advanced thyroid and base of tongue cancers. Adenocarcinoma and other less common histologies are less radiosensitive than laryngeal squamous cell cancer, so laryngectomy should be considered over organ preservation therapy in these cases. Patients with radiation necrosis of the larynx and severe aspiration can also be offered total laryngectomy. Contraindications for surgery include the presence of distant metastases or synchronous tumors that are incurable, poor systemic health resulting in high anesthetic risk, and tumor that encases bilateral common or internal carotid arteries. Rutherford K, Parsons S, Cordes S. Extramedullary plasmacytoma of the larynx in an adolescent: a case report and review of the literature. Ear Nose Throat J. 2009 Feb. 88(2):E1-7. [Medline]. Desai SC, Allen C, Chernock R, Haughey B. Pathology quiz case 1. Primary diffuse large B-cell lymphoma of the larynx. Arch Otolaryngol Head Neck Surg. 2011 May. 137(5):526, 528. [Medline]. SEER Cancer Statistics Review, 1975-2008. Available at http://seer.cancer.gov/csr/1975_2008. Larynx. AJCC Cancer Staging Manual. 7. New York, NY: Springer; 2010. 57-62. Total Laryngectomy. Eugene N. Myers. Operative Otolaryngology: Head and Neck Surgery. 2nd. Elsevier Health Sciences; 2008. Agrawal N, Goldenberg D. Primary and salvage total laryngectomy. Otolaryngol Clin North Am. 2008 Aug. 41(4):771-80, vii. [Medline]. Wax MK, Touma BJ, Ramadan HH. Tracheostomal stenosis after laryngectomy: incidence and predisposing factors. Otolaryngol Head Neck Surg. 1995 Sep. 113(3):242-7. [Medline]. Howlader N, Noone AM, Krapcho M, Garshell J, Miller D, et al. SEER Cancer Statistics Review, 1975-2012, National Cancer Institute. National Cancer Institute. Available at http://seer.cancer.gov/csr/1975_2012/. April 2015; Accessed: February 29, 2016. Laryngeal and Hypopharyngeal Cancer. American Cancer Society. Available at http://www.cancer.org/cancer/laryngealandhypopharyngealcancer/detailedguide/laryngeal-and-hypopharyngeal-cancer-key-statistics. February 17, 2016; Accessed: February 29, 2016.